Many people have a strong connection to Waituna for a variety of reasons, including provision of food, economic, recreation, and social opportunities. For some this has been over many generations. Highly significant to Ngāi Tahu, Waituna translates to “water of eels” as it used to be a major food basket providing a wide variety of mahinga kai (traditional Ngāi Tahu foods). This was recognised by a Statutory Acknowledgement under the Ngāi Tahu Claims Settlement Act 1998. Photos courtesy R. Waghorn and R. Thompson's book "Looking Back - The History of Kapuka South", and R. Sutton. While there is lots of discussion around the environmental concerns at Waituna, the investments families and businesses have made in their land in the Waituna catchment have contributed to the economic and social development of the area, some over a number of generations. 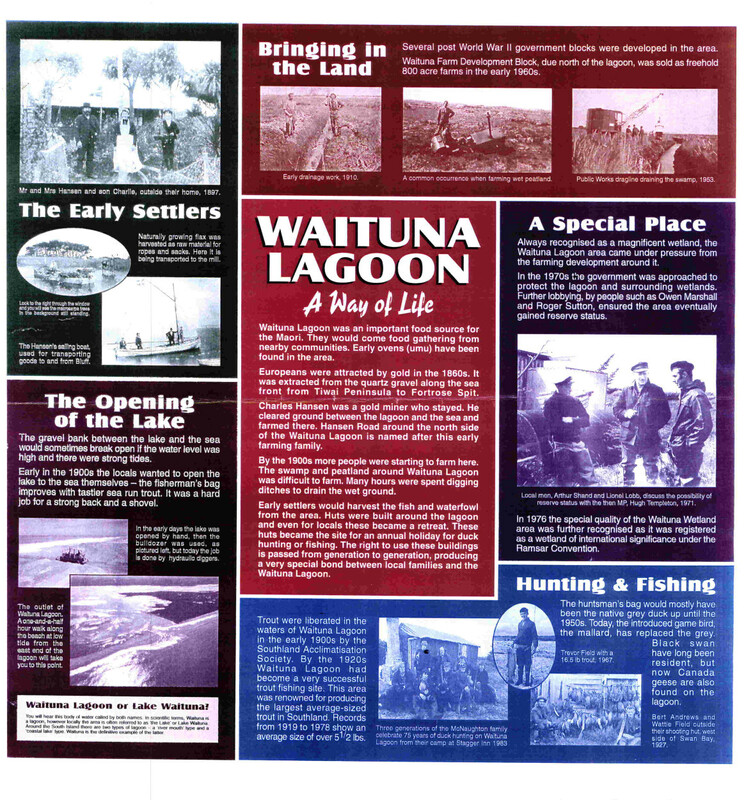 The stories in the Waituna web book are a rich, first-hand account of people's experiences at Waituna. The stories and anecdotes were gathered to gain a broader picture of what the Waituna catchment and lagoon was like in the early days, mostly from the 1950s to the 1980s, before scientific monitoring began. They help bring the human context to changing values and concerns about the unique Waituna environment and its ecology. Fishing is a popular past time in the Waituna Lagoon. Photo by Chris Owen. Waituna Lagoon is a popular trout fishing destination for many Southland and overseas anglers. 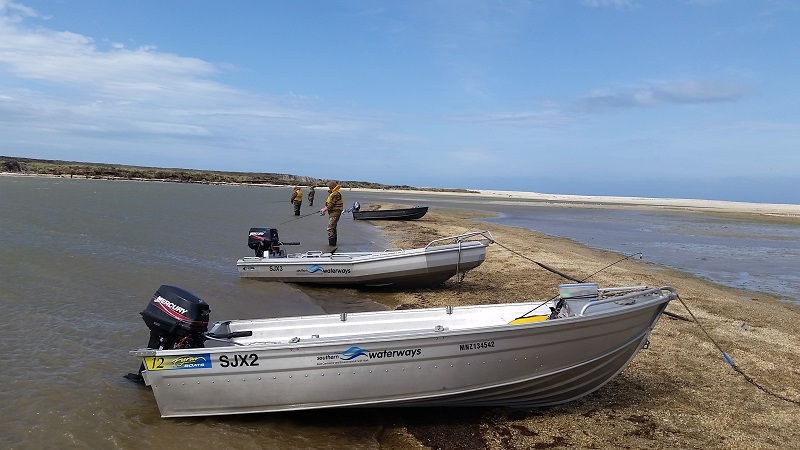 Each year Waituna Lagoon receives at least 2,240 angler visits (Fish & Game Southland). Anglers visit for a variety of reasons including family history, proximity to Invercargill, the rugged landscape and of course the opportunity to fish for big brown trout. Waituna Lagoon harbours numerous large brown trout. The average size of a Waituna trout is 550mm - the highest average trout length of any Southland waterbody. Trout were liberated in the lagoon in 1900, and had formed a self-sustaining population by 1918 (Riddell et al. 1988). The current population is a mixture of sea-run and freshwater fish, and has breeding redds and nursery grounds in the tributary streams. Fish and Game spawning counts (conducted in July each year) have revealed that over 1,500 trout spawn in the creeks that feed Waituna Lagoon. In the past some commercial eel fishing also took place. Waituna Lagoon also has a rich duck hunting history. Mallard ducks (Anas platyrhynchos) are primarily targeted, but other game bird species present on the lagoon include the Australasian Shoveler (Anas rhynchotis), Paradise Shelduck (Tadorna variegata), Black Swan (Cygnus atratus) and Canada goose (Branta Canadensis; now listed as unprotected). 50 duck hunting permits were issued for the 2017 season in Waituna, anyone hunting on Department of Conservation land needs to get a permit from the local office in addition to a hunting licence from Fish & Game. The next duck hunting season starts on 5 May 2018. Occasionally people visit the lagoon to bird-watch; neighbouring Awarua Bay and New River Estuary are also popular bird-watching spots.